Talmud תלמוד by Tzvee Zahavy: Is the smiling Taoist vinegar taster Jewish? Is the smiling Taoist vinegar taster Jewish? No, the Taoist vinegar taster is not Jewish, and not Talmudic. A friend of mine a while ago sent me a quote from Lao Tzu, which reminded me of a wonderful book that I read several years ago called, "The Tao of Pooh." "You see, Pooh," I said, "a lot of people don't seem to know what Taoism is..."
"Yes?" said Pooh, blinking his eyes." So that's what this chapter is for - to explain things a bit." "And the easiest way to do that would be for us to go to China for a moment." "Of course. All we need to do is, lean back, relax, and there we are." Let's imagine that we have walked down a narrow street in a large Chinese city and have found a small shop that sells scrolls painted in the classic manner. We go inside and ask to be shown something allegorical - something humorous, perhaps, but with some sort of Timeless Meaning. The shopkeeper smiles. "I have just the thing,", he tells us. "A copy of The Vinegar Tasters!" He leads us to a large table and unrolls the scroll, placing it down for us to examine. "Excuse me - I must attend to something for a moment," he says, and goes into the back of the shop, leaving us alone with the painting. Although we can see that this is a fairly recent version, we know that the original was painted long ago; just when is uncertain. But by now, the theme of the painting is well known. We see three men standing around a vat of vinegar. Each has dipped his finger into the vinegar and has tasted it. The expression on each man's face shows his individual reaction. Since the painting is allegorical, we are to understand that these are no ordinary vinegar tasters, but are instead representatives of the "Three Teachings" of China, and that the vinegar they are sampling represents the Essence of Life. 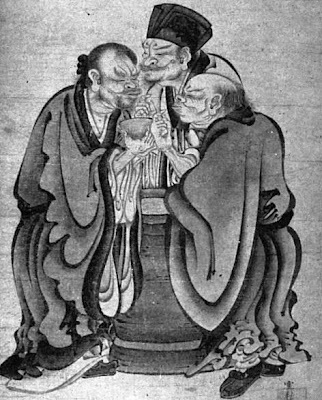 The three masters are K'ung Fu-tse (Confucius), Buddha, and Lao-tse, author of the oldest existing book of Taoism. The first has a sour look on his face, the second wears a bitter expression, but the third man is smiling. To Kung Fu-tse (kung FOOdsuh), life seemed rather sour. He believed that the present was out step with the past, and that the government of man on earth was out of harmony with the Way of Heaven, the government of, the universe. Therefore, he emphasized reverence for the Ancestors, as well as for the ancient rituals and ceremonies in which the emperor, as the Son of Heaven, acted as intermediary between limitless heaven and limited earth. Under Confucianism, the use of precisely measured court music, prescribed steps, actions, and phrases all added up to an extremely complex system of rituals, each used for a particular purpose at a particular time. A saying was recorded about K'ung Fu-tse: "If the mat was not straight, the Master would not sit." This ought to give an indication of the extent to which things were carried out under Confucianism. To Buddha, the second figure in the painting, life on earth was bitter, filled with attachments and desires that led to suffering. The world was seen as a setter of traps, a generator of illusions, a revolving wheel of pain for all creatures. In order to find peace, the Buddhist considered it necessary to transcend "the world of dust" and reach Nirvana, literally a state of "no wind." Although the essentially optimistic attitude of the Chinese altered Buddhism considerably after it was brought in from its native India, the devout Buddhist often saw the way to Nirvana interrupted all the same by the bitter wind of everyday existence. To Lao-tse (LAOdsuh), the harmony that naturally existed between heaven and earth from the very beginning could be found by anyone at any time, but not by following the rules of the Confucianists. As he stated in his Tao To Ching (DAO DEH JEENG), the "Tao Virtue Book," earth was in essence a reflection of heaven, run by the same laws - not by the laws of men. These laws affected not only the spinning of distant planets, but the activities of the birds in the forest and the fish in the sea. According to Lao-tse, the more man interfered with the natural balance produced and governed by the universal laws, the further away the harmony retreated into the distance. The more forcing, the more trouble. Whether heavy or fight, wet or dry, fast or slow, everything had its own nature already within it, which could not be violated without causing difficulties. When abstract and arbitrary rules were imposed from the outside, struggle was inevitable. Only then did life become sour. To Lao-tse, the world was not a setter of traps but a teacher of valuable lessons. Its lessons needed to be learned, just as its laws needed to be followed; then all would go well. Rather than turn away from "the world of dust," Lao-tse advised others to "join the dust of the world." What he saw operating behind everything in heaven and earth he called Tao (DAO), "the Way." A basic principle of Lao-tse's teaching was that this Way of the Universe could not be adequately described in words, and that it would be insulting both to its unlimited power and to the intelligent human mind to attempt to do so. Still, its nature could be understood, and those who cared the most about it, and the life from which it was inseparable, understood it best. Over the centuries Lao-tse's classic teachings were developed and divided into philosophical, monastic, and folk religious forms. All of these could be included under the general heading of Taoism. But the basic Taoism that we are concerned with here is simply a particular way of appreciating, learning from, and working with whatever happens in everyday life. From the Taoist point of view, the natural result of this harmonious way of living is happiness. You might say that happy serenity is the most noticeable characteristic of the Taoist personality, and a subtle sense of humor is apparent even in the most profound Taoist writings, such as the twenty-five-hundred-year-old Tao Te Ching. In the writings of Taoism's second major writer, Chuang-tse (JUANGdsuh), quiet laughter seems to bubble up like water from a fountain. "But what does that have to do with vinegar?' asked Pooh. "I thought I had explained that," I said. "I don't think so," said Pooh. "Well, then, I'll explain it now." In the painting, why is Lao-tse smiling? After all, that vinegar that represents life must certainly have an unpleasant taste, as the expressions on the faces of the other two men indicate. But, through working in harmony with life's circumstances, Taoist understanding changes what others may perceive as negative into something positive. From the Taoist point of view, sourness and bitterness come from the interfering and unappreciative mind. Life itself, when understood and utilized for what it is, is sweet. That is the message of The Vinegar Tasters. "Sweet? You mean like honey?" asked Pooh. "Well, maybe not that sweet," I said. "That would be overdoing it a bit." "Are we still supposed to be in China?" Pooh asked cautiously. "No, we're through explaining and now we're back at the writing table." Very lovely the story and the message! It really makes you want to be part of the dust in the world. Can You Read a Book on the Sabbath? Daily Beast: Is there a moderate islam? Are Goldman Sach's Islamic Bonds Kosher?